True to the motto of luxurious simplicity, a technical crew member can install a Ming system large enough to cater to the requirements of a 165-foot yacht in under 90 minutes. Without the assistance of an external technician. And even while at sea. From the very moment it begins operation, Ming promises complete reliability. Firstly, the built-in batteries are rechargeable, last for weeks and do not need replacing. Plus the need to recharge is signalled to the crew well in advance. Secondly, the integrated Self-Check function continually monitors the overall system and reports any anomalies before the guests or even the crew notice them, thus ensuring trouble-free operation twenty-four hours a day. 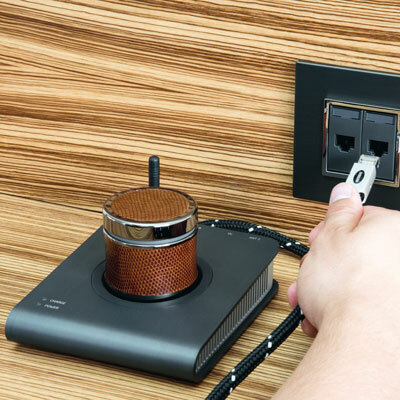 For maximum compatibility, the docking stations can communicate via WLAN as well as LAN, while also supporting Power over Ethernet. This allows for a fast and simple retrofit on practically any yacht without the need for additional wiring or antennae.